Step 1 In a large bowl, mix together 1 1/2 cups flour, the herbs, a scant half-teaspoon salt and the sugar. Cut 6 tablespoons (three-fourths stick) butter into one-half-inch pieces and, with a pastry cutter, two knives or your fingers, quickly work the butter (and optional shortening) into the flour until it is reduced to pea-sized pieces. Sprinkle ice water, 1 tablespoon at a time and no more than 5, into the mixture and fluff with a fork until the dough is just moist enough to gather into a ball. Do not overwork the dough. Flatten the ball into a disk and cover tightly with plastic wrap. Refrigerate at least 30 minutes to chill thoroughly. Step 2 Meanwhile, in a large saucepan, bring the broth to a simmer over high heat. Reduce the heat to maintain a bare simmer. Add the onions and poach for 2 minutes. Stir in the carrots, celery, mushrooms and potatoes and cook at a gentle simmer until crisp-tender, about 10 minutes. Add the leeks and peas for the last half minute of simmering. Step 3Drain the vegetables, reserving the broth. Place the vegetables in a 2 1/2 -quart baking dish and add the turkey, stirring gently to combine evenly. Step 4Measure the broth, adding additional if needed to bring the volume to 4 cups. Place the broth back in the saucepan and reduce over high heat by half to 2 cups. Remove from heat and set aside. Step 5Make the veloute (sauce): In a medium heavy-bottom saucepan, melt the remaining 3 tablespoons butter over medium high heat. Sprinkle the remaining one-fourth cup flour over the melted butter and cook, stirring constantly, to make a white roux, about 3 minutes. Do not let the roux color. Off heat, whisk the reduced broth into the roux, then stir in the cream and bring to a gentle boil. Cook just until the mixture coats the back of a spoon, about 3 minutes, stirring constantly. Remove from heat and season with 1 teaspoon salt and one-eighth teaspoon pepper, or to taste. Step 6Pour the veloute over the vegetables and turkey in the baking dish, check the seasoning, and set aside. Heat the oven to 400 degrees. Step 7On a lightly floured board or surface, roll the dough so it is large enough to cover the top of the dish with 1 inch hanging over the side. Drape the dough over the filled dish, trimming the sides to even them out. Roll up the edges and crimp over the edge to seal the pie. Step 8If you'd like, mix the egg yolk with a teaspoon of water and brush over the crust to give it a rich sheen as it bakes. Step 9Slit the top of the crust in a few places to allow steam to escape as the pie bakes. Step 1 0Place the pie in the oven and bake for 20 minutes. Reduce the heat to 375 degrees and continue to bake until the crust is golden and the sauce is bubbling, an additional 10 to15 minutes. Step 1 1Let the pie rest for at least 15 minutes before serving. It will stay warm for quite a long time. In Recipes-list.com we have selected the most viewed recipes from category - Leftovers Main courses . Enjoy the best recipes specially selected for you! 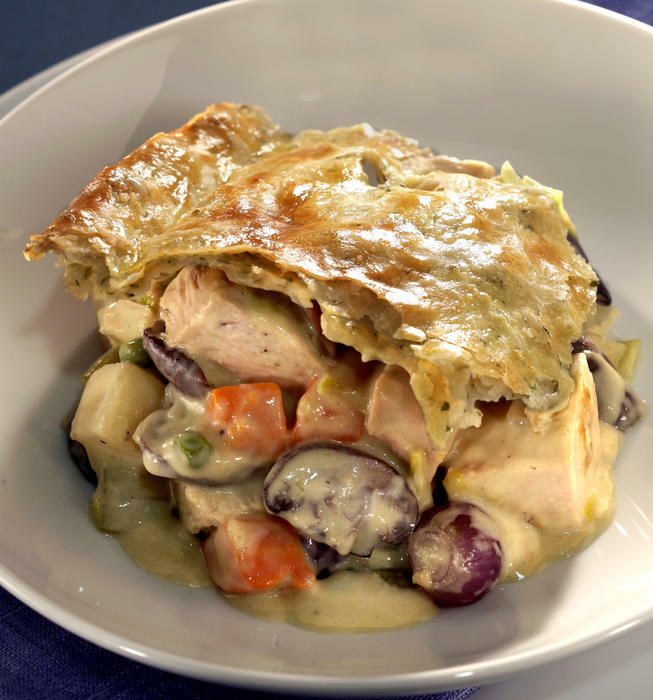 Turkey pot pie is the right choice that will satisfy all your claims.